SURPRISE!! I got flowers delivered to my office today from my sweetie!! Wow! The best part is that I totally did not expect this because I have always looked at Valentine's Day as a day for kids to have fun at school, have a party, make sentences out of candy hearts and generally show who they have crushes on!! For adults, I see it as a "hallmark holiday", created so the card, candy, restaurants, and more can have one more excuse to take money out of your pocket. I'm not a cynic, I just think that love should be every day and not just celebrated one day a year. I'm sure there are others out there that think this same way. In fact, it's 7pm and I'm still at work. Mostly women are left here because the guys had to scoot home for dinners out, and all the other stuff that goes with the holiday. Well, good for them and their wives, hope they can live up to it year after year. Seems like alot of pressure. Oh well, the surprise was fantastic! I love him and I know that he loves me. 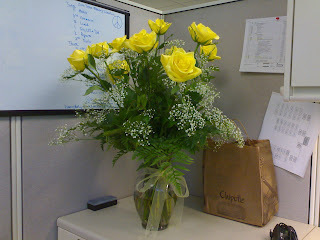 It was just great to get flowers at work and for him to show me! He's terrific! Happy Valentine's Day! I Love You! !